So I picked up another Bolaño. Ever since I read 2666, I must say I have become a fan. And somehow this is another one of this amazing captivating pieces. After reading now a total of 5 novels of him, I must say that this is quite a good book to read and therefore recommendable. 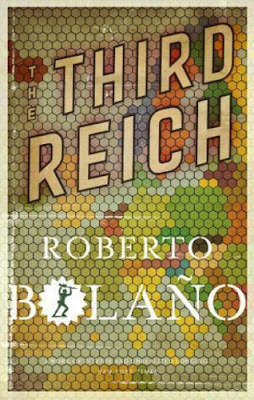 This novel is about Udo Berger, a German war game enthusiast, who was vacationing in Spain together with his girlfriend, Ingeborg. The story happens sometime in the late 20th-century, when Spain still used the peseta (yes folks, it's pre-Euro) yet World War II was over. The couple goes to a beach town, yet instead of enjoying the beach like everyone else, Udo decides to just set up his game (named The Third Reich, hence the book title) and play. He encounters shady characters throughout the whole novel. First, there's the eccentric German couple, Hanna and Charly: Hanna is divorced while Charly is this weirdo, and together, they seem to have found each other as a consolation prize. Charly is bummed by the fact that the other tourists are not so approachable, unlike Udo and Ingeborg, but given Charly's personality I don't find myself surprised by that. Udo is not a big fan of Charly either, who has weird drinking habits, and who befriends the local weirdos, like the Wolf and the Lamb, two Spaniards who have nothing better to do than to loiter around the beach area. And then there's El Quemado, or the Burned One, a mysterious character who manages the paddle boats, lives at the beach, and eventually becomes Udo's playmate with his game. And to round out the list of weird characters, there's Frau Else, the General Manager of the hotel, who is married to a mysterious sick man. Of course, since there are strange characters, there are also strange events. Charly dies: he goes swimming, drunk, and somehow he just disappears in front of everyone, only to be found dead a couple of weeks later. Everyone acts erratically, and at some point I suspect the narrator (Udo) is unreliable either. Anyway, the whole novel feels like noir, definitely dark, moody, and eerily creepy. At some point it was losing its grip on me, but overall I found it rather refreshing, given that it's a psychological thriller. As much as I know that nothing good is going to happen as I slowly approached its end, I was nevertheless looking forward to it, wondering what exactly would happen, as the suspense slowly builds up. Overall, I would recommend this to fans of Roberto Bolaño. I think this book provides a preview of the mental torment that his later novels give its readers. I give it 4 out of 5 stars.